As Chile plunges into its first general strike in eight years, outside observers can be excused if they are a bit surprised. Chile is supposed to be the stodgy, conservative, institutionality-respecting corner of South America, where nothing ever happens. But this is changing as the public runs out of patience after centuries of being told that if they wait and work hard, someday their children will be better off than they are. This entry was posted in Uncategorized on August 24, 2011 by Steven Bodzin. Caracas Chronicles put up a clever post about the many arbitration cases that Venezuela is facing. Companies say the suits are a result of the Chavez administration’s inconsistency on gold mining policy, while the most charitable interpretation is that they are the result of a series of unserious gold (and copper) miners getting their hands on Venezuelan concessions. This probably isn’t the place for the debate, but anyway, go read their post. It’s good. Rusoro says more or less what they told me, but this time telling people with the good taste to avoid such disreputable corners of the internet. Devil’s Excrement also touches on gold, but in this case is looking at repatriation, rather than nationalization. The folks at BBO, an investment bank in Caracas, published an analysis of Venezuela’s foreign reserves this week that focuses particularly on gold holdings. Very nice timing! It can’t be downloaded, but if you really want a copy, contact moctavio@bbo.com. But the real news comes, as usual, from the Chiguire. If you don’t speak Spanish, this is a very good reason to learn. One last little note. Chavez’s government normally offers book value for expropriated assets. This usually works out well for the Bolivarians because most companies take maximum advantage of depreciation in order to dodge taxes. You have to be financially sophisticated to find the book value Rusoro carries…but let’s just say shareholders wouldn’t be sobbing. Decent story giving the overall story of the PDVSA Pension Ponzi on Reuters today. Nothing much new in there except that PDVSA retirees are marching against the company. But not a bad way to get up to speed if, like a sane person, you haven’t been hanging on every word at this blog for the past seven months. Retired workers from the oil behemoth have taken to the streets in protest. Their beef: nearly half a billion dollars of pension fund money was lost after it was invested in what turned out to be a Madoff-style Ponzi scheme run by a U.S. financial advisor who was closely linked to President Hugo Chavez’s government. The fraud case centers on Francisco Illarramendi, a Connecticut hedge fund manager with joint U.S.-Venezuelan citizenship who used to work as a U.S.-based advisor to PDVSA and the Finance Ministry. You get the idea. Check it out if you’re a bit lost on this whole Caso Illarramendi. This entry was posted in Uncategorized on August 17, 2011 by Steven Bodzin. 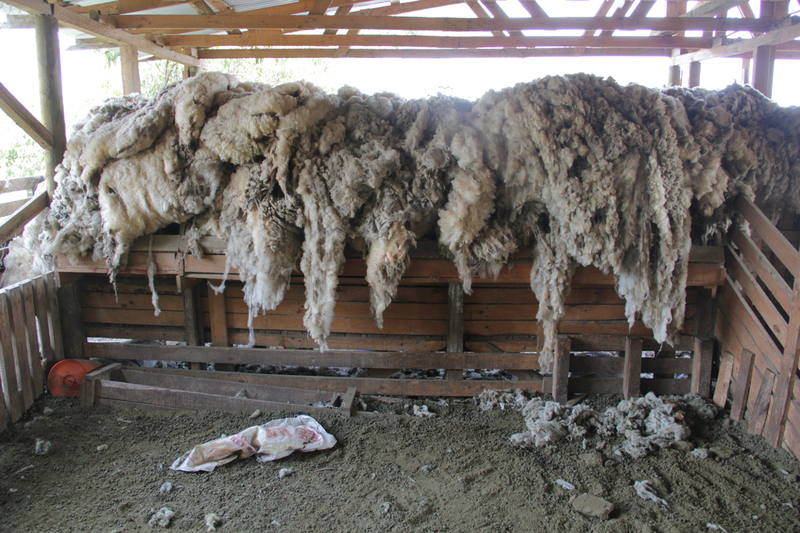 Harvested organic wool in the Santiago Metropolitan Region, Chile. This is a pile of wool on its way to be composted into soil mulch. The farmer sheared the sheep, but the price for raw wool in Chile is so low that it’s not worth it to haul the fiber to market. That despite international prices for finished Chilean wool yarn of around USD$20 a pound. If you want to start a company cleaning, carding and spinning wool in Chile, there may be money to be made in the gap between cost & price. …the underlying assumption of an Arbenz style land reform — that subsistence farming is appealing to a broad segment of the population – is much less true now than in 1954. It’s hard to assume that rural residents today would be willing to live the way their grandparents did, and hard to begrudge them for expecting running water, electricity, cell phones and internet. That said, it doesn’t answer what to do in places like Brazil or Chile where there are many rural peasants who know nothing but farming, and who could really do with a plot of land to call their own. Maybe we don’t need baby greens in Mato Grosso, but there wouldn’t be any harm in government seeding some new industries in easily shipped organic goods like carrots, apples and wool. (Or up there in the tropics, fruit concentrates and cocoa.) A bit of help with land rights, organic certification and training could indeed create some sustainable industries. Anyway, go read Quasecarioca’s latest article and get yourself some learning. This entry was posted in Uncategorized on August 16, 2011 by Steven Bodzin. Just busy. Weirdness in Venezuela & Chile = plenty of paid work for me, and less time for the website. My bedtime reading has been the PDVSA annual report. The local press and wires have picked up on most of the newsworthy items in there, but I’ll have my take on it soon. For now, go enjoy your summer (in the Northern Hemisphere) or your winter that feels like summer (here in the south). This entry was posted in Uncategorized on August 11, 2011 by Steven Bodzin.